Kaho is back home in Reno, Nev.
One of the most touted recruits ever to sign with the Huskies has asked for his release from his National Letter of Intent. Ale Kaho, a five-star linebacker who signed with Washington last December, has made a formal request through the NCAA to be released from his NLI, a family member told The Seattle Times on Thursday afternoon. Kaho was in Seattle for six weeks this summer but was unable to participate in the Huskies’ formal offseason training program because he still had one high-school class to complete before he could enroll at UW, according to a source close to the team. Two members of Kaho’s family, an aunt and an uncle, died suddenly in July. Kaho flew home to Reno, Nev., for their memorial services and has remained there. Family members were worried about Kaho’s health after he apparently lost some 20 pounds while in Seattle. Kaho’s parents are also going through a divorce, putting a strain on the entire family, one of Kaho’s family members said in an interview. Kaho, listed at 6-feet-1 and 218 pounds, was ranked by 247Sports as the No. 21 overall recruit in the nation for the Class of 2018, the No. 1 inside linebacker in the nation and the No. 3 overall recruit in the West. He signed an NLI with the Huskies during the early signing period last December, the only five-star recruit to ever do so during Chris Petersen’s 13 years as a head coach. Petersen on Thursday morning acknowledged Kaho would not be at the Huskies’ first fall-camp practice Friday, saying the linebacker was dealing with family issues. But Petersen did not provided any details beyond that. 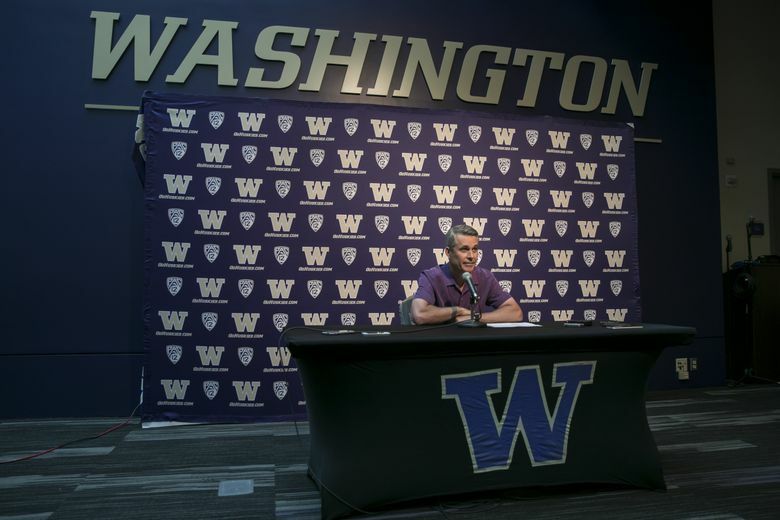 Reached Thursday evening, a UW spokesman had no comment on Kaho’s release request. Asked about the outside linebacker position, Petersen’s eyes lit up when he mentioned Joe Tryon’s name. Tryon, a redshirt freshman out of Renton’s Hazen High, had a good showing in his first spring with the team in April, and he could be in the mix for playing time at Buck linebacker this fall. What, in particular, about Tryon does he like? Another redshirt freshman to watch in camp is tight end Cade Otton, the former Tumwater High standout. “Cade Otton, we think he had a really good offseason and a really good redshirt year and we’re anxious to get him in the mix,” Petersen said. Junior wide receiver Aaron Fuller, with the blessing of the family of Husky legend Chuck Carroll, will wear jersey No. 2 this season, the first UW player to do so since 2014. That number had been retired to honor Carroll, a star for the Huskies in 1927-28 who was elected into the College Football Hall of Fame in 1958. Kasen Williams was the last to wear No. 2, from 2011-2014. Among the newest additions to the UW fall roster, released Thursday, is junior wide receiver Fatu Sua-Godinet, listed at 6-feet and 186 pounds. A native of Honululu, Sua-Godinet spent the past two seasons at Delaware State. Other new additions (previously unannounced): DB Angelo Sarchi (Skyview HS, Vancouver, Wash.); OL Will Pliska (Lake Washington HS, Kirkland); OL Noah Hellyer (Skyview HS, Vancouver, Wash.); OL Gage Harty (University HS, Spokane); RB Malik Braxton (Meadowdale HS, Lynnwood).